The Thief of Bagdad is a 1940 British Technicolor Arabian fantasy film, produced by Alexander Korda, directed by Michael Powell, Ludwig Berger, and Tim Whelan, with additional contributions by Korda's brothers Vincent and Zoltán and William Cameron Menzies. The film stars child actor Sabu, Conrad Veidt, John Justin, and June Duprez. It was distributed in the US and the UK by United Artists. Although produced by Alexander Korda's company London Films in London, due to the outbreak of World War II, the film was completed in California. The Thief of Bagdad won the Academy Awards for Cinematography, Art Direction (Vincent Korda) and Special Effects (Lawrence W. Butler, Jack Whitney) and marks the first major use of bluescreening in film. It was also nominated for Original Music Score (Miklós Rózsa), the first time a British film score had been recognized at the Academy Awards. Although this production is a remake of the 1924 version, the two films have differences, most significantly the thief and the prince are separate characters in the 1940 version. The backstory for The Thief of Bagdad is told in flashback, mimicking the style of the Arabian Nights. Ahmad, the naive sultan of Bagdad, is convinced by his evil Grand Vizier Jaffar to go out into the city disguised as a poor man to get to know his subjects (in the manner of his grandfather Harun al-Rashid). Jaffar then has Ahmad thrown into a dungeon, where he encounters the young thief Abu, who arranges their escape. They flee to Basra, where Ahmad meets its Princess. Jaffar journeys to Basra, for he too desires the Princess. Her father, the Sultan, is fascinated by the magical mechanical flying horse that Jaffar, a skilled sorcerer, offers; he agrees to the proposed marriage. Upon hearing this, the Princess, now deeply in love with Ahmad, runs away. Confronted by Ahmad, Jaffar magically blinds him and turns Abu into a dog; the spell can only be broken if Jaffar holds the Princess in his arms. The Princess is captured and sold in the slave market. She is bought secretly by Jaffar, but falls into a deep sleep from which he cannot rouse her. Ahmad is tricked by Jaffar's servant Halima into awakening the Princess. Halima then lures her onto Jaffar's ship by telling her that there is a doctor aboard who can cure Ahmad's blindness. Jaffar informs the Princess about the spell, so she allows herself to be embraced; Ahmad's sight is restored and Abu returned to human form. They pursue in a small boat, but Jaffar conjures up a storm that shipwrecks them. The Princess persuades Jaffar to return her to Basra; she implores her father not to force her into the marriage. Furious when the Sultan agrees, Jaffar presents him with another mechanical toy: the "Silver Maid", a many-armed dancing statue which stabs the Sultan to death. Abu awakes alone on a deserted beach and finds a bottle. When he opens it, an enormous genie appears. Embittered by his imprisonment, the genie informs Abu that he is going to kill him, but Abu tricks him back into the bottle. The genie then offers to grant Abu three wishes if he will let him out again. The hungry boy uses his first wish to ask for sausages. When Abu demands to know where Ahmad is, the genie flies Abu to the top of the highest mountain in the world, where inside a temple is an enormous statue with a large jewel, the All-Seeing Eye, set in its forehead. The genie tells Abu that the Eye will show him the location of Ahmad. Abu fights off a giant spider while climbing the statue to steal the gem. The genie then takes Abu to Ahmad. When Ahmad asks to see the Princess, Abu has him gaze into the All-Seeing Eye, where he sees Jaffar arranging for the Princess to inhale the fragrance of the Blue Rose of Forgetfulness, which makes her forget her love. In agony, Ahmad lashes out at Abu. During the ensuing argument, Abu unthinkingly wishes Ahmad to Bagdad. The genie, freed after granting the last wish, abandons Abu in the wilderness. Ahmad appears in Jaffar's palace and is quickly captured, but seeing him restores the Princess's memory. The furious usurper sentences them both to death. Abu, unwilling to watch further, shatters the All-Seeing Eye and is transported to the "land of legend", where he is thanked by the Old King for freeing its inhabitants. As a reward, he is given a magic crossbow and is named the king's successor. To save Ahmad, however, Abu steals the king's magic flying carpet and rushes to Ahmad's rescue. Abu's aerial arrival in Bagdad (which fulfills a prophecy cited a few times during the course of the film) sparks a revolt against Jaffar. Abu kills the fleeing Jaffar with his crossbow, and Ahmad regains his kingdom and his love. However, when Abu hears Ahmad telling the people of his plan to send Abu to school to train to become his new Grand Vizier, Abu flies away on the carpet to find fun and adventure. Mary Morris as Halima, Jaffar's agent, and the "Silver Maid"
Alexander Korda had intended to cast Vivien Leigh as the Princess, but she went to Hollywood to be with Laurence Olivier. Producer Alexander Korda, after a search for a director, chose German filmmaker Ludwig Berger in early 1939, but by the early summer became dissatisfied with Berger's overall conception of the movie—which was too small-scale and intimate—and, specifically, the score that Berger proposed to use. Essentially behind Berger's back, British director Michael Powell was brought in to shoot various scenes—and Powell's scheduled work grew in amount and importance whilst, in the meantime, Korda himself did his best to undercut Berger on his own set; and while publicly siding with Berger on the issue of the music, he also undercut Berger's chosen composer (Oscar Straus) by bringing in Miklos Rozsa and putting him into an office directly adjacent to Berger's with a piano, to work on a score. Eventually, Berger was persuaded to walk away from the project, and American filmmaker Tim Whelan, who had just finished work on another Korda-produced movie (Q Planes) was brought in to help augment Powell's work. But with the outbreak of the Second World War in September 1939, work was suspended as Powell was taken off the picture and put to work on a morale-boosting documentary, The Lion Has Wings. By the end of the year, Korda found himself running out of money and credit, and in the spring of 1940 he arranged to move the entire production to Hollywood (where some shots of the movie's young star Sabu, had to be redone since he had grown more than 3 inches (76 mm) during the year since shooting had commenced). Powell had remained in England, and so direction was taken up in Hollywood by Menzies and Zoltan Korda during the summer of 1940—including shots of the heroes in the Grand Canyon, Monument Valley, Bryce Canyon:287 and the Painted Desert; the scenes in the Temple of the Goddess of Light, among the very last to be written, were done late in the summer, and the film was being edited and re-structured into the fall of 1940. "Dashing, dazzling, and altogether magical, The Thief of Bagdad is an enchanting fantasy for children of all ages". The film was Korda's most successful in the US. The film was also a success in Europe selling 5,135,145 tickets in France becoming the seventh most attended film of the year. The New York Times reviewer Bosley Crowther enthused that the film "ranks next to Fantasia as the most beguiling and wondrous film of this troubled season". Crowther praised "its truly magnificent color" and the performances of all five main actors. Roger Ebert added The Thief of Bagdad to his "Great Movies" list, calling it "on a level with The Wizard of Oz". According to Ebert, "it maintains a consistent spirit, and that spirit is one of headlong joy in storytelling". He praised the performances of Sabu and Veidt ("perfectly pitched to the needs of the screenplay"), though he was less impressed with the chemistry between Duprez and Justin ("rather bloodless"). While its 1924 predecessor holds a 95% "fresh" rating from the review aggregator website Rotten Tomatoes, the 1940 Thief of Bagdad has a 100% rating based on 25 reviews, with an average score of 8.9/10. Its consensus states, "Dashing, dazzling, and altogether magical, The Thief of Bagdad is an enchanting fantasy for children of all ages". Although it was a remake of a 1924 silent film starring Douglas Fairbanks, this film has been highly influential on later movies based on The Book of One Thousand and One Nights setting. For example, the Disney film Aladdin borrows freely from it, particularly the characters of the evil Vizier and the Sultan, both drawn with a marked similarity to the characters in The Thief of Bagdad. The villian Jafar is named after Jaffar. The thieving monkey Abu in the Disney cartoon is obviously based on the boy played by Sabu. Richard Williams, speaking about his film The Thief and the Cobbler, said that one of his interests was in creating an Oriental fantasy that did not copy from it. The Prince of Persia video game franchise also shares similar characteristics with the film. Larry Butler invented the first proper chroma key process for the special effects scenes in this film, a variation on the existing "traveling matte" process. This technique has since become the standard process for separating screen elements and/or actors from their backgrounds and placing them on new backgrounds for special effects purposes, and has since been used in thousands of films. The film was released on VHS by The Samuel Goldwyn Company. The film was released on DVD by MGM in 2002. That version is now out of print. The Criterion Collection released a two-disc DVD release in 2008 that includes a commentary track by filmmakers Martin Scorsese and Francis Ford Coppola, who are both longtime fans of the film (their comments were recorded separately and then edited together). It has been released on Region B-locked Blu-rays in Germany (Anolis Entertainment, 2012) and the UK (Network Distributing, 2015). The UK disc also includes image galleries and the original theatrical trailer. The German disc features the same extras, plus additional trailers, an audio commentary and a 53-minute documentary on the film's star, Sabu. ^ "The 13th Academy Awards (1941) Nominees and Winners". oscars.org. Archived from the original on 6 July 2011. Retrieved 17 June 2013. ^ "NY Times: The Thief of Bagdad". NY Times. Retrieved 13 December 2008. ^ "The Thief of Bagdad (1940)". rottentomatoes.com. Retrieved 26 July 2009. ^ a b Bosley Crowther (6 December 1940). "'The Thief of Bagdad,' a Delightful Fairy Tale, at the Music Hall". The New York Times. Retrieved 26 July 2009. ^ a b c Roger Ebert (6 May 2009). "Thief of Bagdad (1940)". rogerebert.com. Retrieved 26 July 2009. ^ "The Thief of Bagdad Blu-ray (United Kingdom)". blu-ray.com. Leibfried, Philip; Willits, Malcolm (2004). Alexander Korda's The Thief of Bagdad, An Arabian Fantasy. Hollywood, Calif.: Hypostyle Hall Publishers. ISBN 0-9675253-1-4. 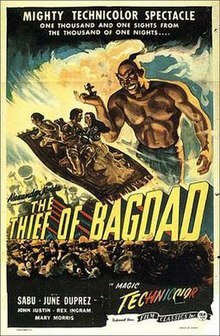 Wikimedia Commons has media related to The Thief of Bagdad (1940 film).